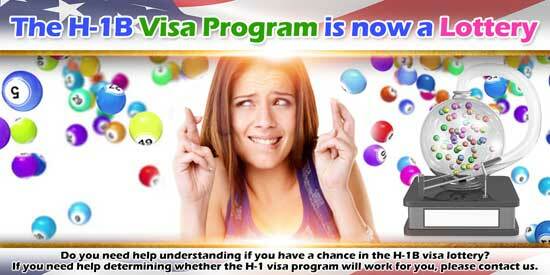 In our H-1B visa guide, we refer to the H-1B visa lottery, the current problems in the USCIS processing of H-1B visas. This article describes the problem. The H-1B visa program has supplied the United States with temporary professional workers. Generally, the workers have a bachelor’s degree or above, and work in the area of their education. While Congress has always limited the number of H-1B visas, for several years now only 65,000 each year are available. A review of the number of H-1B applications filed shows that demand always exceeds this allocation. Mismatch between the supply of H-1B visas and demand for them has turned the H-1B visa process into a lottery, an H-1B visa lottery. Every year, approximately 65,000 visas are available on the start of the federal fiscal year, October 1. USCIS regulations provide that employers may file a request for an H-1B visa in advance of need. An employer may file up to 6 months early. Combining these two restraints results in petitioning employers participating in a lottery. It also means an abbreviated H-1B season. Each year, immigration attorneys start preparing H-1B visa applications in January for submission to the H-1B visa lottery. Once the application is complete, the attorney transmits it to USCIS so that it is received in the week starting April 1. The USCIS then accepts H-1B visa applications filed for five days. It then runs a lottery picking 65,000 applications out of the approximate 200,000 that it received. For this reason, you can see that an employer runs about a one in three chance of USCIS selecting the application. Of course a selection is winning the H-1B visa lottery. Employers find out by June whether USCIS accepted the application. Given the lottery system in effect now, the first question for an employer is whether the employer can identify an employee that it wants to hire in October by the prior January. If an employer has an immediate need for professional employee, the H-1B visa program will not work. Similarly, if the employer identified the employee after April, the employer would have to wait until the following January in order to file the petition. As an employer, if you need help in understanding whether participating in the H-1B visa lottery makes sense, we can go over your situation in a strategy consultation. We’ll determine whether it is worth your time and effort. Alternatively, if you can work with these constraints and need help with the H-1B visa application, please contact us.